Steve, with panel participants, Karl Champley, Elle H-Millard and Alberto Villalobos. You may recall from a recent post, Steve was invited to moderate a panel on “Innovation in Kitchen Design” at What’s New, What’s Next (WNWN) in New York City. The panel was a success and the entire event truly delightful! As an interior designer, staying abreast of the latest in design trends is paramount and events like WNWN make that possible. And fun to boot! By moderating this panel, Steve was able to learn even more about the newest trends in kitchen technology and looks forward to incorporating these trends into future client projects! A highlight of this year’s WNWN for both Steve and Jill was the Grange suite, where the brand’s latest designs, finishes and inspirations abounded. As you probably know, Grange is a favorite line of ours, and is often times one of the first things guests to the steve mckenzie’s showroom take note of. The way Grange combines textures, finishes and styles – in addition to all of their customization options is seriously awe-inspiring. And the functionality is abundant. Having NYC as a backdrop to WNWN is absolutely exciting, but some of our most memorable moments was visiting with some of our Atlanta design friends – Barbara Westbrook and Beth Lacefield in particular – while there! A visit to Chelsea Frames/Gallerie Protege (the locale of Steve’s 2012 NYC art show) reminded us of the importance of not only art in a space, but beautiful, quality custom framed art in a space. It’s these details which elevate a space from fine to fabulous! A unique perspective of the Empire State Building… street level, aglow at night. For now, we’ll end thanking all of those who made our time at WNWN truly memorable – especially the Grange and Viking teams who invited Steve to moderate the panel. This was an event that will not be soon forgotten! Steve McKenzie at What’s NEW, What’s NEXT in NYC! If you’ll be in The Big Apple next week, make plans to attend What’s NEW, What’s NEXT, and see Steve as moderator for the “Innovation in Kitchen Design” panel! Join GRANGE and Viking Range, for a panel discussion on innovation in kitchen design including top industry names and NKBA Insiders: Karl Champley, Alberto Villalobos and Elle H-Millard with moderator Steve McKenzie. Bites will be provided by Michelin-Star rated Executive Chef Abram Bissell of The Modern in Grange’s contemporary test kitchen. Such a great lineup for the panel and the full lineup for the day is even more impressive! Click here to check out all the details for What’s NEW, What’s NEXT 2017 and let us know if you plan to attend!! Hope to see you in NYC! It’s our End of Season Sale this week with 20% off the entire store, special furniture pieces at deep discounts, a 75% off Table and lots more. Spruce up your outdoor living space, office, home and don’t forget to stock up your Gift Closet! Stop in soon or email us for details as we love to ship to our clients far and wide. 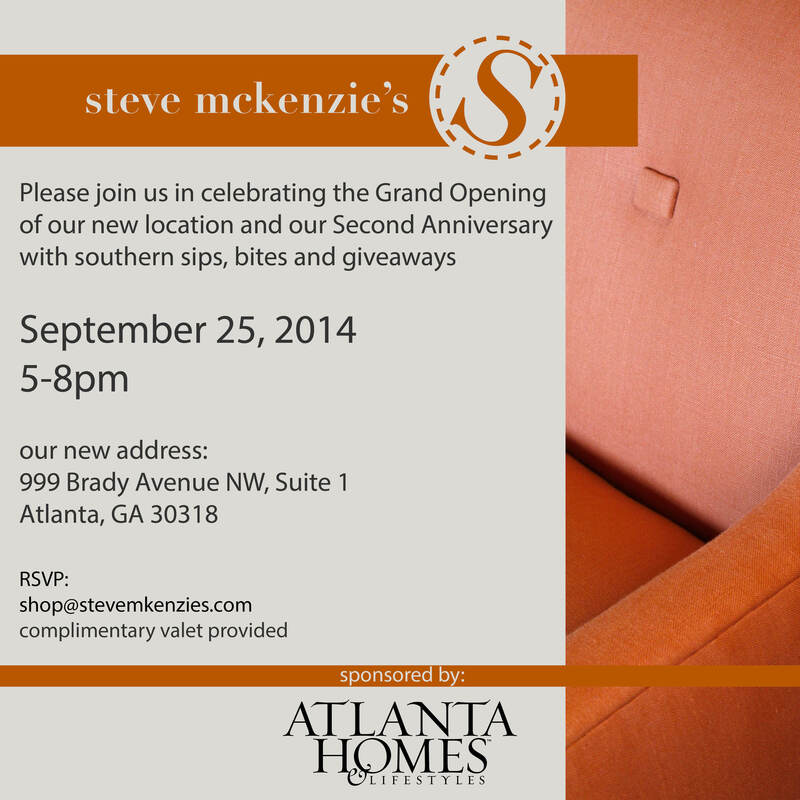 We look forward to seeing you at steve mckenzie’s, and bring a couple of friends because friends are fun! We believe you need to meet the fabulous pattern visionary, Kimberly Lewis, whose eponymous company – featuring some amazing wallpaper – we’re thrilled to be representing here in the southeast! Steve and Jill origionally met Kimberly Lewis while on a trip to Masion Objet with Grange last year. Her company is a Brooklyn based design studio that specializes in playful, preppy and patterned home boutique wallpaper and home decor products. They believe in joyful, coy color that can sometimes get a bit out of hand (but not too out of hand! ), flirty patterns that add whimsy, and socially, environmentally conscious design and product development. Their products are designed in Kimberly’s Brooklyn, NY studio and are made close by in the Northeast by highly skilled craftsman and manufacturers. Kimberly founded her company in 2011 and shortly after was dubbed by Apartment Therapy as one of the “8 Brooklyn Wallpaper Designers To Watch.” Her interest in design started at a young age; growing up Kimberly’s mother predicted that one day she would design wallpaper for Laura Ashley. Kimberly likes to think that she is even happier with this outcome. She grew up in New England and has been living in New York City for the past decade; Kimberly likes to think the Northeast is in her DNA and finds inspiration in both the bustle of the city and the calm of the country and seaside. Kimberly holds a Bachelors of Industrial Design from Pratt Institute and studied Textile Design at the Danish Design School. Outside of her own company Kimberly has designed and developed patterns and products for companies such as Clinique, Macy’s, Dwellstudio, SkipHop, WolfGordon, The Jewish Museum of NYC and JMcLaughlin. In 2013, Kimberly was honored to have four of her wallpapers acquired by the Brooklyn Museum for their decorative arts permanent collection. sm’s: Can you please share a bit about your background/how you started Kimberly Lewis and how you gained the courage to break out on your own? KL: I studied industrial design at Pratt Institute. While I was a student I was constantly applying patterns to my 3 dimensional designs and that’s when it clicked that perhaps that is something I wanted to pursue. I was able to study textile design for a summer in Copenhagen through Pratt and after that it was clear to me what that I wanted to make print and pattern a focus for my career. I’ve always had an entrepreneurial itch ever since I was a child. My first business was launched my senior year of college. I designed and sewed pillows and tried my hand selling them on Etsy and at craft fairs. My first line of pillows didn’t pan out too well. You have to inventory your mistakes and use them as stepping stones and moments for learning. Looking back on launching my wallpaper line, I really had no clue what I was doing, but I didn’t really care because I was creating something that was all my own and learning every step of the way. I spent a year researching wallpaper, manufacturers, reading business books and getting my hands on whatever I could learn before launching. It was exhilarating and honestly, in my mind at that time, I didn’t have room to think about failure; I just wanted to get my product out into the world and take it from there. sm’s: What inspires you/your art? KL: Living and working in NYC is a constant source of inspiration for me. I love the energy, the pace and the fact that I can walk down a street and pop into amazing stores, or see someone with fantastic style on the street or catch an awe-inducing exhibit at a museum. Inspiration is literally all around me here; I always have something to look at or a place to visit to stir up some inspiration if I’m feeling flat. sm’s: What is your vision, not only for Kimberly Lewis, but also the individual pieces you create? KL: I want to create patterns that elicit joy in people. I want my products to spark an emotion, hopefully a happy one! sm’s: What are the differences in your collections – i.e. how do you create such unique designs that remain a part of one, cohesive line? KL: I personally design every pattern so you can definitely see my hand and style in all of my patterns. I am thinking about the end use of the pattern while designing; how it will look in a room, what type of furnishings a designer may style it with, etc. My work has definitely evolved a bit, but I try to keep it in line with my brand and what my customers want. sm’s: What’s on the horizon for Kimberly Lewis? KL: I am hoping to start licensing my prints and patterns in the new year and focusing on connecting more with interior designers. sm’s: As an artist/business person how do you recharge? KL: I am an introvert, so I recharge by carving out me-time. I love doing things that make me feel good, like taking a pilates or barre class, or curling up with a good book. Twice a year, the design elite converge on Paris see what the world’s finest designers have to offer our world of interiors. This January represented the 20th anniversary of Maison & Objet and in celebration, everyone brought their best of all things pertaining to interiors. In fact, this show was so robust, Steve and Jill required a full two days just to see everything once at Maison & Objet. It is a lot to take in! Butterflies were everywhere at Maison & Objet, along with a few tropical birds thrown in for good measure. Beginning with the beautiful new Exceptions de Grange piece with the butterfly front, as seen above. DEYROLLE, a delightful find in the 6th in Paris, on rue de Bac, is a visual feast of taxidermy and entomology. You can select your own butterflies and create your own boxes that they will build on site for you. Exhibitor Koket, purveyors of the glam lifestyle, showed off an amazing gold and fuchsia butterfly wallpaper, and also had pieces featured in the new Fifty Shades of Grey motion picture. Famous French glass house, Lalique, launched a line of beautiful butterflies by artist Damien Hirst; they were stunning! And just to prove that we are on trend here in Atlanta, we were so pleased to read the inaugural issue of Atlanta Magazine’s HOME and see their spread on the butterfly trend..
A perennial favorite for designers, blue and white is coming back with a vengeance. Dust off those oriental vases and get ready to introduce them back into your space! One exhibitor, Moissonnier, also with a beautiful storefront in the 6th in Paris, creates beautiful bespoke furniture that really embraced this trend. This hand painted console was an absolute inspiration! Even creative pottery in blue and white was featured in abundance. Ralph Lauren Home brought back the blue and white pottery to their exhibition as well. The third trend that was very prominent was all about pastels, especially pinks. From Modern furniture to key accessories, it was everywhere! Even Le Creuset launched pink and blue product lines. This all pink display inside the high gloss black armoire really drove the pastel point home for us. Grange featured this beautiful blush tone as a sweet little accent inside two of their Exceptions pieces. As you can tell, we could go on forever about all the inspirational pieces we saw, but we hope you enjoyed these selected trends from Maison & Objet Paris 2015. We will do one final installment about our amazing trip to Lyon to experience the incredible Grange Factory for ourselves and share what makes Grange so special; hint – we can’t wait for you to see their artisans at work! We will also be sharing a full album of all the images captured on this recent trip. Thank you for reliving this magical time with us, we hope you’re as inspired as we are by these top trends from Maison & Objet 2015! New from Grange… Just for YOU! As we shared in an earlier post, Steve and Jill have just returned from France where they had the opportunity to attend Maison & Objet, as a guest of Grange, a leading furniture manufacturer in France with over 100 years of history. The first new Grange collection we’d like to share, Médaillon, is based on the traditional lines of Louis XV style, yet cleaner and more comfortable and approachable. In this line, Grange combined Oak finishes found in country estates with cherry tops to create an elegant collection that may fit in both formal dining spaces or your family’s kitchen. As a Grange retailer, steve mckenzie’s will have this collection on view in our showroom this spring! The buffet and mirror have beautiful lines and great proportions and beautifully round out the pieces for the dining space. The collection’s Medallion back chairs are available both in cane back and upholstered finishings. The Médaillon collection also includes two smaller proportioned Bergere chairs in a beautiful oak frame. Can’t you envision these lovely pieces in a keeping room off the kitchen? The next new collection by Grange, Country Chic, is based on the country homes in the areas of Ile de Ré and Lubéron. These pieces feature cerused oak with a pop of aqua, perfect for beach or country homes. Also new from Grange is an exciting modular that features the same unique functionality of Grange’s other modular pieces, with bookshelves which are able to effortlessly slide in front of the TV component of the piece – perfectly concealing the television in style. However, these updated Grange modulars are not nearly as tall as their earlier designs. This new piece stands at 61″ tall, an ideal petite size for smaller spaces. We just cannot wait to bring these new pieces by Grange into the steve mckenzie’s showroom, so you’ll have an opportunity to experience them in person – take it from us, they’re even better than in these beautiful photos! If you have any questions about these pieces, or would like additional information, please reach out to the steve mckenzie’s team. We’d love to work with you to bring these pieces into you or your client’s home, where we’re sure you’ll love living with them! Steve and Jill recently returned from France, where, as guests of Grange Furniture, they had the unique opportunity to experience the beauty of Grange by visiting three of their stores, their stand at Maison & Objet and the Grange factory in Lyon. To say it was a trip to remember would be an understatement! It was an absolute explosion inspiration. Not only were the Grange showrooms and Maison & Objet stand breathtaking, the factory was unbelievable, and naturally, they were in France – where they went inspiration shopping in Paris, focusing specifically on the Saint-Germain-des-Prés in the 6th arrondissement. Grange has really expanded their upholstery collection and keying off traditional French styling. Combining this look with modern fabrics creates some really beautiful pieces. We’re especially excited with how bold Grange is becoming with the use of multiple fabrics on most of their pieces. This petite club chair with bamboo styling across the back was an instant favorite! This Trianon Sofa was especially beautiful with its combination of traditional legs paired with modern arms and cushions trimmed in orange welt – as you probably know, our favorite combination! Customization is a hallmark of Grange. Finishes can be combined to create unique, one-of-a-kind pieces. This Louis XV desk with the hint of peacock inside the legs and just around the inside of the desk was seriously stunning. The new Grand Siecle, introduced by Grange at the last Maison & Objet, is beautiful in this painted oak leg and woodtone oak top combination. We love the detailing on the corner makes it truly special. Another stunning collection is the Haussmann, which features a bold scale and stately hardware. This console with door knocker pulls and matching mirror, created a statement vignette. Grange’s modular pieces, which provide not only beauty, but also storage to your space, are another Grange hallmark. The most exciting part of these pieces, is the fact they can be custom configured to fit your specific space and needs. We love the way the book shelves slide to perfectly hide the TV when not in use (a amazing accomplishment!). This unit even has a hidden bar behind the shelves on the far right – ideal for cocktail night! The real piece de resistance is this new large “Miss Butterfly” chest of drawers with the front done in wallpaper. Butterflies were a big trend in Paris and especially at Maison & Objet, as noted by Steve and Jill. We’ll share more about the exciting butterfly trend in an upcoming post, along with many other fabulous trends found at Maison & Objet, so keep your eyes peeled! In addition to our terrific hosts from Grange US, we were joined by Kathy Marshall the talented Kitchen and Interior Designer from Boston, George Logan and Rita Brown of the San Francisco bay area store Indigo & Poppy, and Blogger and Textile Designer, Kimberly Lewis. Joining all these talents lead to many ideas and abundant creativity! We are so glad to have so many new friends and look forward to sharing more about this trendsetting trip over the next few weeks! 2nd Anniversary Party Details – We’ll See YOU There! First and foremost, we need to give our friends at Atlanta Homes & Lifestyles a BIG shout out, as they’re sponsoring our event – and we’re looking forward to celebrating with many of our community’s design tastemakers, thanks to them! In addition to yummy southern-themed bites, we’ll be offering guests our party’s signature cocktail, the “Buckhead Betty,” thanks to the folks at American Spirit Whisky. We’re almost as excited for this cocktail, as we are that Amercian Spirit Whisky will be relocating their distillery to Atlanta! Welcome to our new neighbors! The team here at steve mckenzie’s has also recently acquired some stunning antique French mirrors and objets you just have to come in to see! Finally, Steve’s new art studio and the new McKenzie Design Services studio will be on preview as well! We’re so thrilled for our big event coming up, and look forward to celebrating with you Thursday!